Welcome to Brownell Community Yoga! 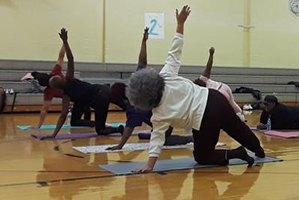 This Community Yoga class is hosted by the Crim Fitness Foundation’s Mindfulness Initiative. If you’re new to yoga or an experienced yogi, this is a great class for you. All levels of yoga practioners are welcomed and encouraged. Whether you’re looking for something to do with friends, a way to relax, stretch out for a run or build muscle strength, yoga has something to offer everyone. Some yoga mats will be available to borrow. If you have your own mat, please bring that along with you. Please wear comfortable and loose fitting clothing. We look forward to practing with you! This class is free to be accessible to all, but if you are able, we welcome donations to make future classes possible. Please visit www.crim.org to make a donation by clicking� here or make a donation in person before or after class.